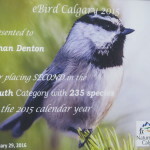 As many of you know, I recently participated in an eBird-run challenge to find the most species in an 80 kilometer circle and the 2015 calendar year. There were three categories: Youth, Beginner, and Experienced, and about 115 participants. In addition to the main competition, there were three seperate challenges. 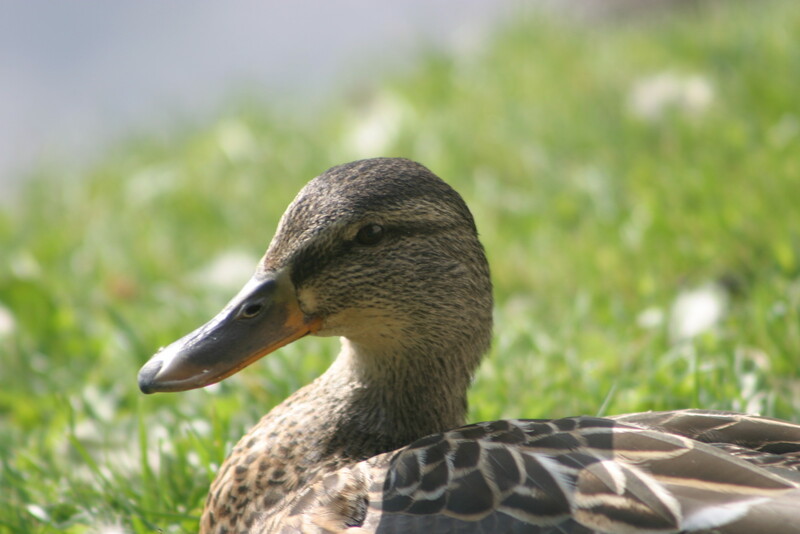 Early Bird Challenge (whoever finds the most species before March 1), Youth Winter Waterfowl Challenge (the most species of waterfowl found before May 1) and the Latecomer Challenge (whoever finds the most new species for their list after August 1). 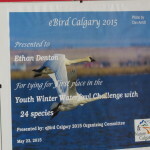 The Latecomer and Early Bird challenges were for all the participants together (so no specific categories), and the Youth Waterfowl one was for the Youth competitors only. Out of the four competitions, I came second in two and tied first for one. It was annoying, for I had been leading the race when I left for England, but the very next day, my main compettitor found 6 new species. Six species, even if I hadn’t been away meant a lot at that stage. The whole year was a fierce battle between me and him, who actually lives in the circle (I don’t). The lead flip-flopped the whole way, most notably when I was in Ontario, then again when he was in the States. I thank him for the competition, but wish he had slacked off a little more! 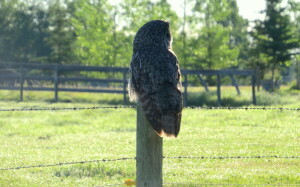 It was still a great year, and I found 235 species in the circle, including one of my favorites, the Great Grey Owl. 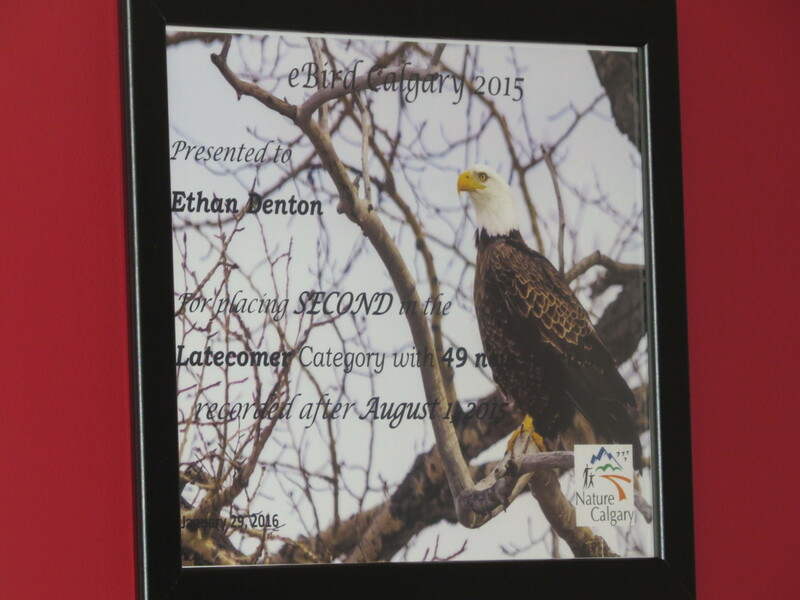 The biggest highlight for me was a Big Day lead by Dan Arndt, which you can read about here. Thank you Dan for that and co-organising this competition! 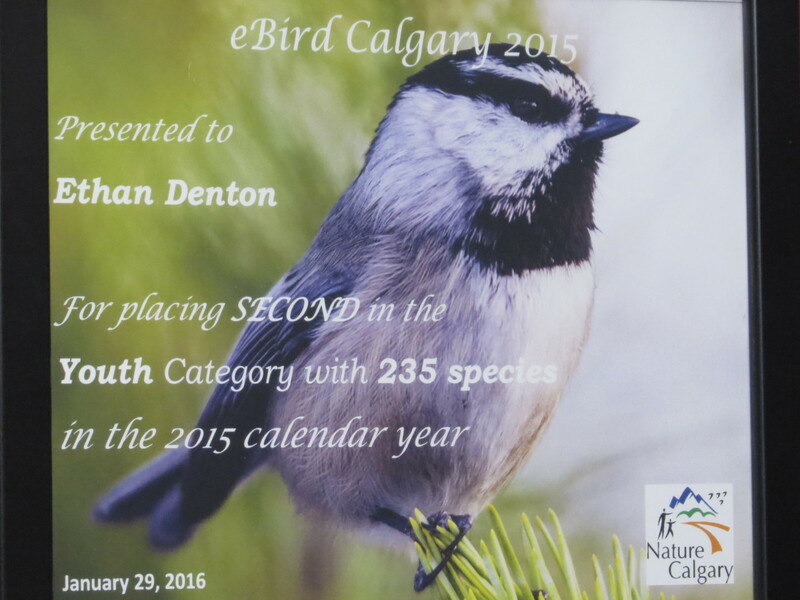 This entry was posted in 2015 Challenge, Birding Events, Birding Trips, Books on February 20, 2016 by BirdBoy. 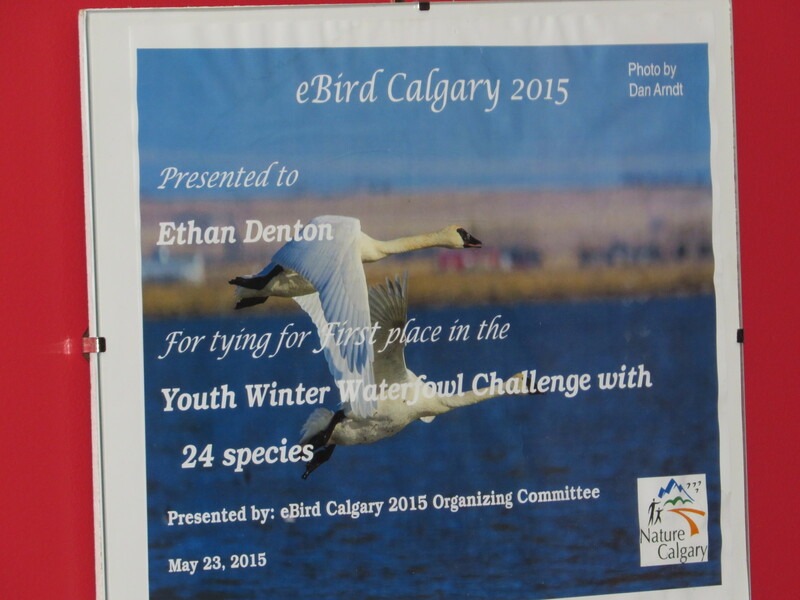 So… I haven’t posted about it for a while, but does anybody remember the 2015 Calgary Challenge? Yeah, Ok, I’ll explain it, just to be sure. The competition does three things: It raises birders knowledge through guided tours and simple practice, it riles birders competitive nature, and, most importantly, it increases the amount of eBird users. 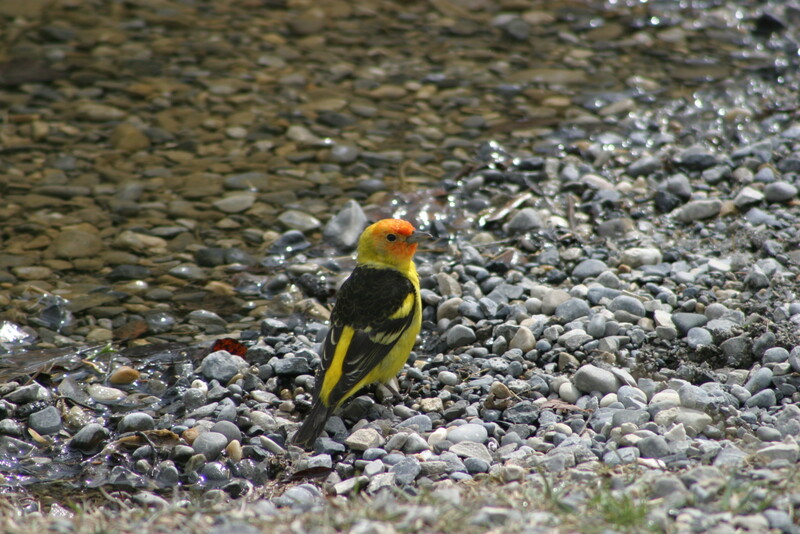 Basically, you need to find as many bird species as you can inside a 80 km circle starting in down town Calgary. Oh, and it would be a good idea to report them to eBird, because if you don’t, it doesn’t count. Anyway, there was a Big Day planned for June 20th, which seemed like it was going to be postponed because of weather, but eventually we went ahead with it. As it turned out, the weather was beautiful. The group consisted of me, my dad, and 8 other birders. Starting at 5:00 am in Water Valley, we continued to an end place of Frank Lake at around 9:30 pm. 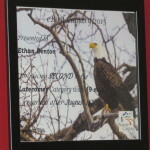 It was going to be a very special day, because if I got one life bird, I would have cracked 300 species. 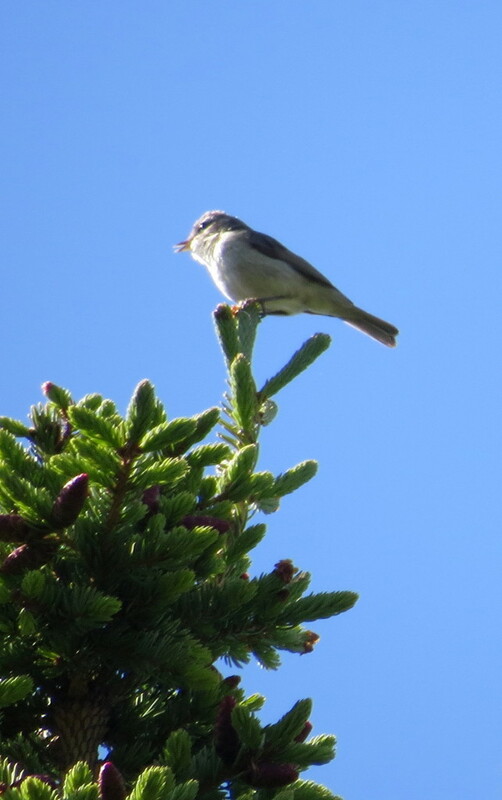 Only a few weeks ago, the first confirmed sighting ever of an Eastern-wood Pewee in Alberta was reported to eBird (my Dad and I recorded the second on the 13, near Lethbridge). Well, you can guess where we started. 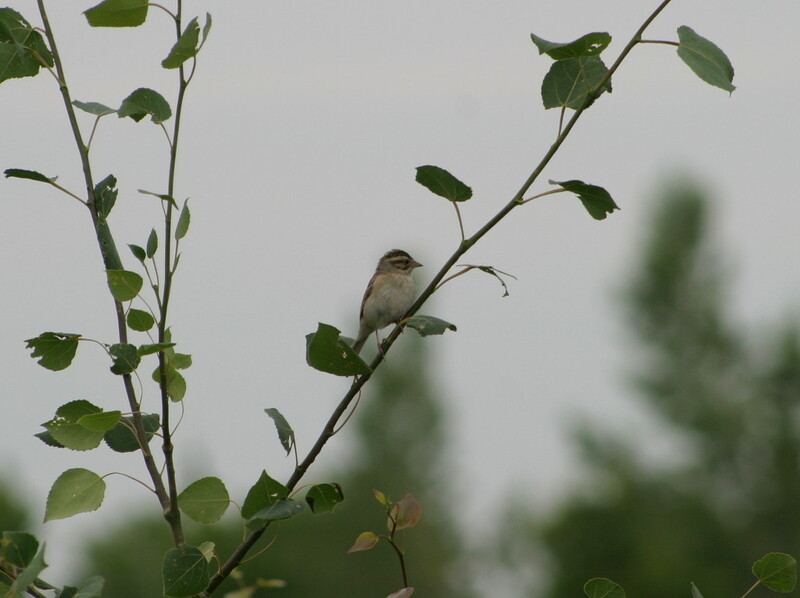 In just under an hour, we recorded 33 species, but no Pewee. On a desperate last effort, some of the group fought their way off of the path to play the recording once more, and, in the distance, it replied. A total of 3 people heard it! A little ways off, a Eastern Phoebe became the target. With our sparkling 100 % average, we fully expected the Phoebe. Fifteen minutes later, we left with 13 non-phoebe species. Ok, maybe we missed the Phoebe, but it was still a good day. Driving along, we came to a field out on the left. 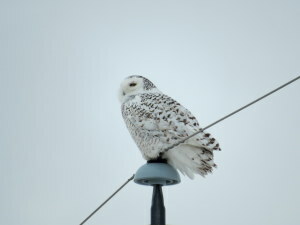 Though the routine scan of the field proved nothing, something was perched on one of the over looking posts. A huge grey head swung round. 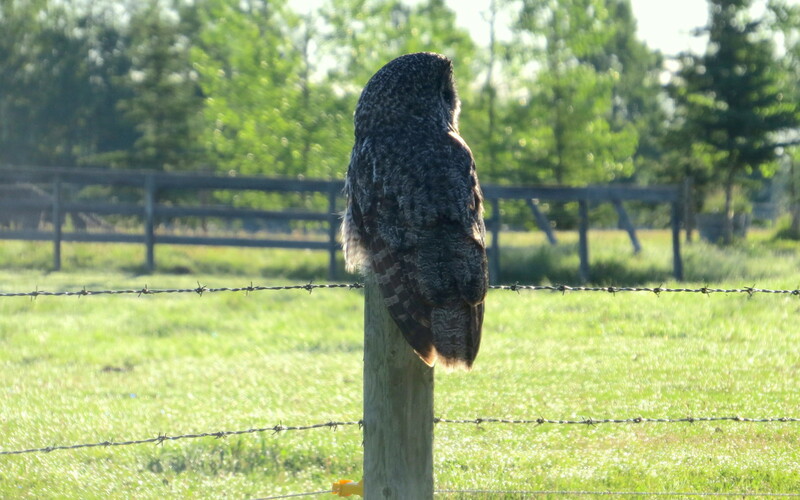 “Great-grey Owl” I breathed. It was only the second that I had ever seen. At the marsh, the birds started to flood in. 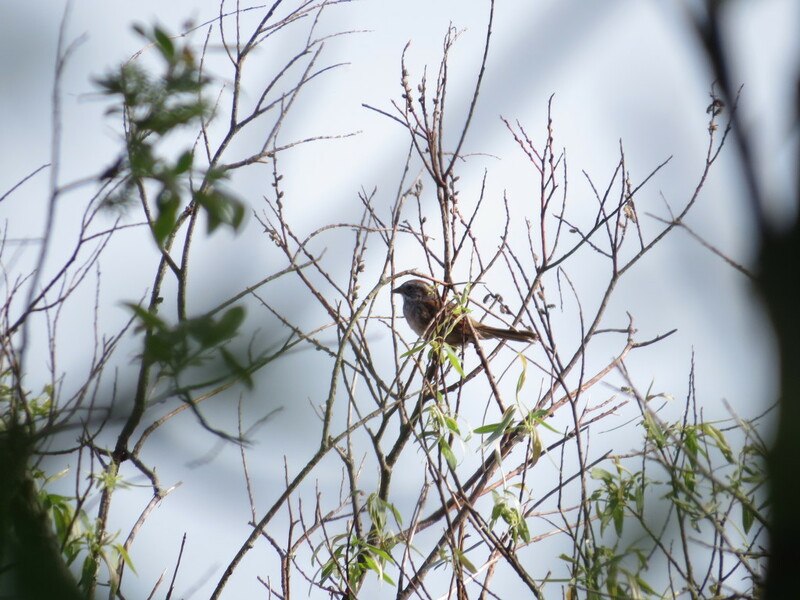 Sora and Wilson’s Snipe lurked in the bottom reaches of the wetland shrubbery, while the middle was occupied by Yellow-throats, Yellow Warblers, Chipping, Song, White-crowned and Swamp Sparrows. A solitary Solitary Sandpiper whistled over us. 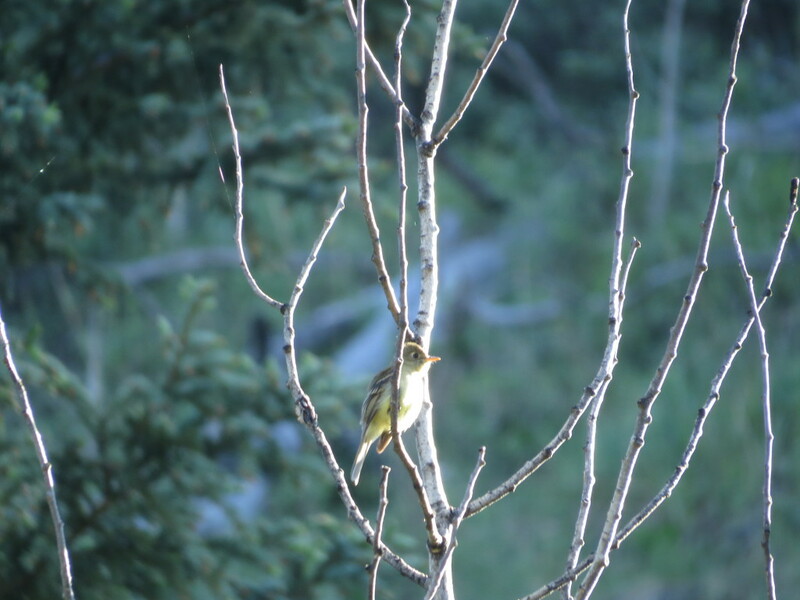 In the woods, Ruby-crowned Kinglets and Tennessee Warblers sang out from the top of the trees, but my attention was held by the high-pitched “Teacha-teacha-teacha-teacha” coming from the forest floor along with the song of the Swainson’s Thrush – yes, it was an Ovenbird! #300 on my life list! 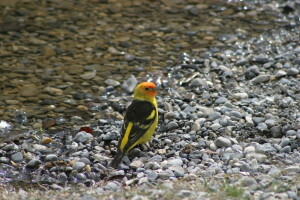 Suddenly, a new bird was seen out on the marsh, a Yellow-bellied Flycatcher – another life bird! On the way to William Bagnall Recreation Area, a medium sized grey blob flew across the road just ahead of our car. As it passed over the car in front of us, I distinctly saw a dash of colour on the head. It was a Spruce Grouse – another lifer! 20 minutes later, we stopped. 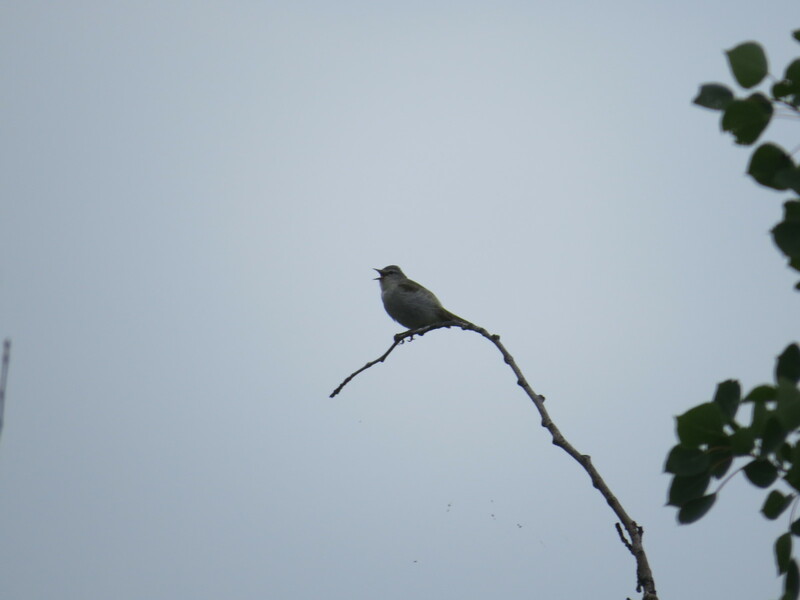 The leader of the group had heard an Olive-sided Flycatcher. “Where is it?” asked my Dad. “Somewhere high up in the back of that group of trees” was the answer. 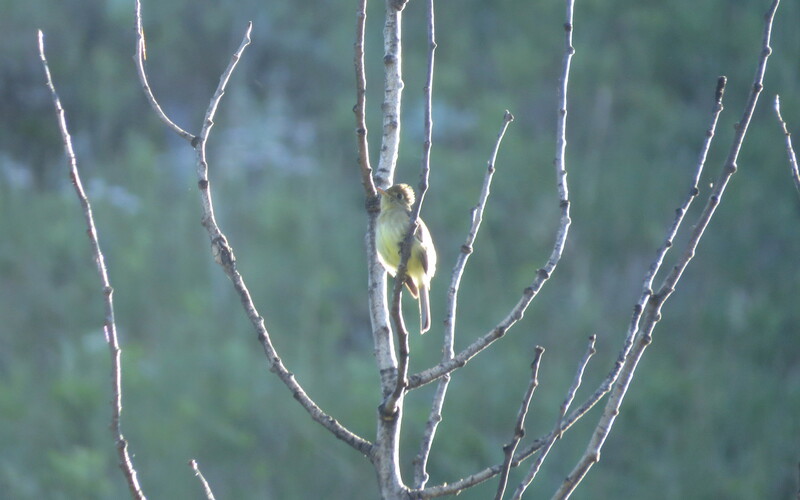 As I stepped to the side to begin looking, I caught sight of a large flycatcher, which turned out to be the Olive-sided. The first thing that we saw at William Bagnall Recreation Area was 3 White-winged Crossbills, birds I figured that I wouldn’t see ’till this coming winter. As we progressed through the area, we picked up a Pileated Woodpecker, Golden-crowned Kinglets, Alder Flycatcher (lifer), and Pacific-slope Flycatcher, also a lifer! Our next stop was at Winchell Lake, which we reached at 9:30 am. around 15 species of smallish songbirds were flitting around the bushes on the side of the road. At one point, a small woodpecker swept into on of these small trees immediately, both me and my dad put it down as a downy woodpecker, but further inspection proved us wrong. It was a Red-naped Sapsucker! A long stretch of marsh and lake lay down a slight slope from the road, and it was here that we recorded the first, and only Sandhill Cranes that day. It was also the first time that I used my spotting scope on the 20th. The pictures are not very good, because they are taken from a distance of about 500 meters, and the zoom on this camera is very good, but when used to full extent, the pictures are not usually very good. Horse Creek Road had quite a few marshes, but there was one main section we wanted to stop at. Wilson’s Snipe were perched on fence poles alongside Red-winged Blackbirds and 3 kinds of swallow. 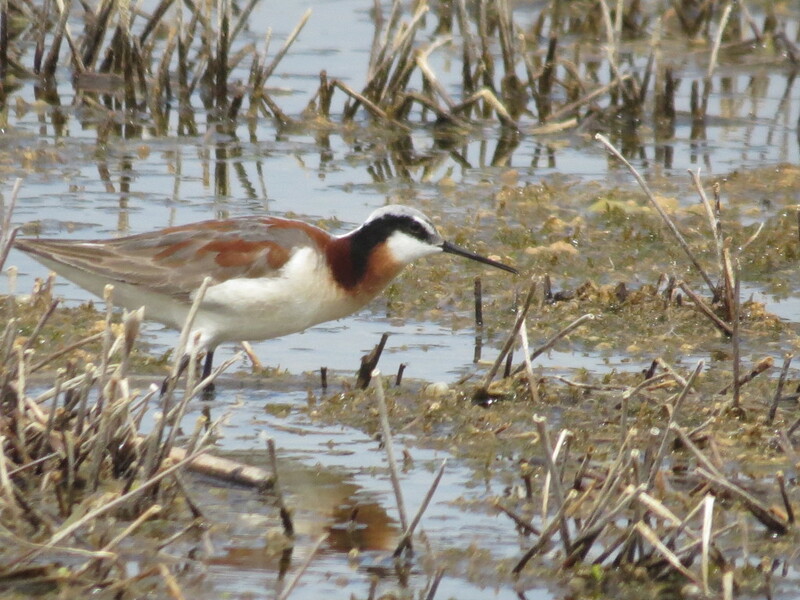 Most unusual observations there were Leconte’s Sparrow, Nelson’s Sparrow, and, most uncommon, agitated behaviour from an adult Wilson’s Phalarope. Presumably there was a nest somewhere around, but we did not find it. 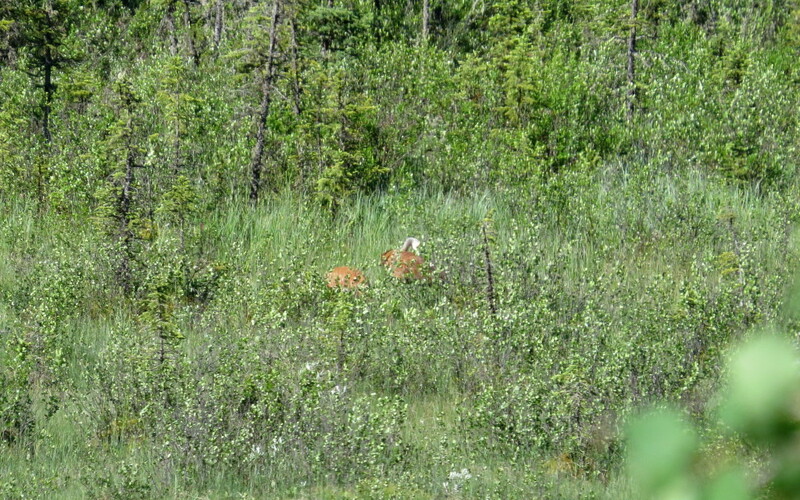 At Brown-Lowery Provincial Park, we met what were really the first mosquitoes of the day. And they sure made up for any that we had previously missed! The first birds there were 8 Evening Grosbeaks, birds that I had not expected to see again until the winter. We moved on to find a Pacific Wren, 2 American Three-toed Woodpeckers, and, unexpectedly, 8 Cape May Warblers, among 9 other species there. Recently, a few Bobolinks have been seen, around the area, and some of the people in our group wanted to go see them, so we drove out to where they had been hanging out. Indeed, we saw them. 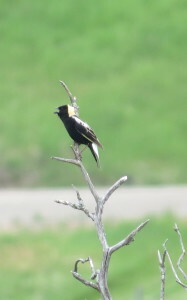 Such striking birds, are Bobolinks. 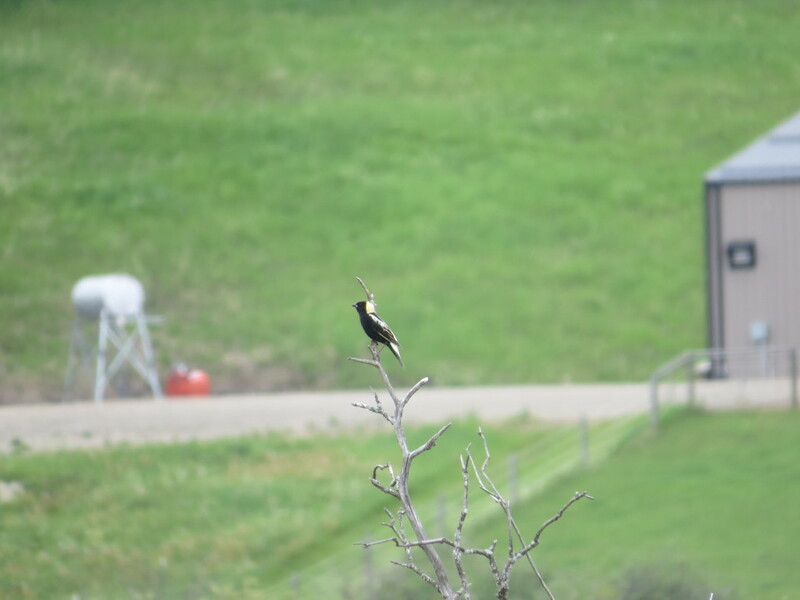 Searching for Black-headed Grosbeaks, we drove to a place where we saw everything but Black-headed Grosbeaks. 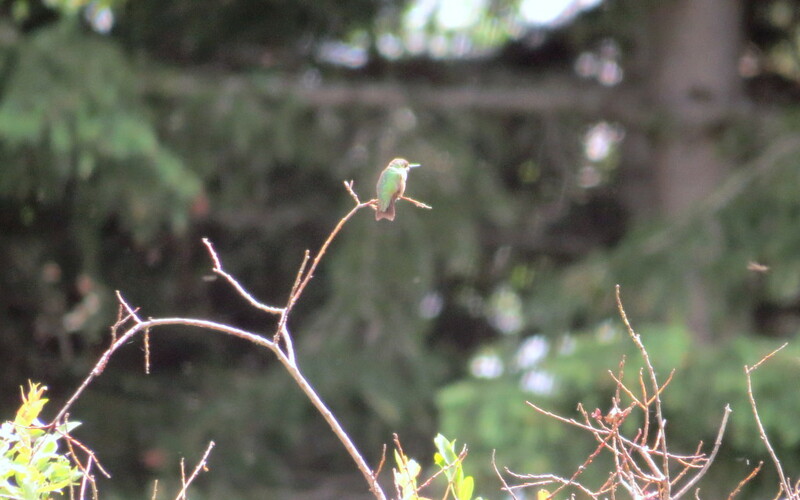 A Calliope Hummingbird, a Pileated Woodpecker, young Bluebirds, a Warbling Vireo, but no Black-headed Grosbeaks. Pity, I really wanted to see them again. By this Windy Point, we were carpooling. It was there that I saw heard my first Rock Wren. I couldn’t stop looking for it, but I never saw it. Luckily, I saw one not that long ago at Barrier Lake. 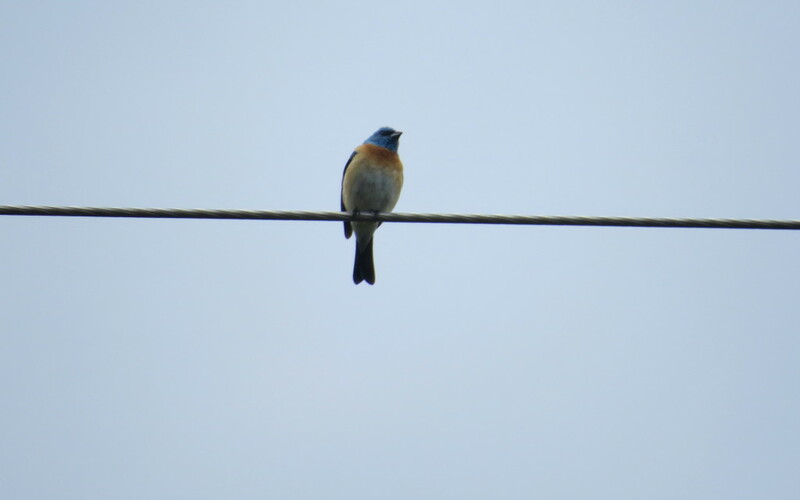 Other birds we saw there included Lazuli Bunting, Dusky Flycatcher, a Townsend’s Warbler (also heard), a Grey Jay, and 2 Red-tailed Hawks. 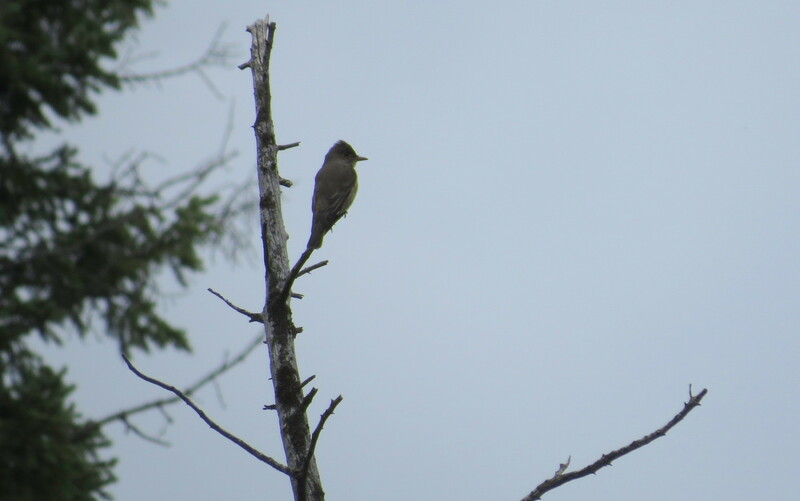 Indian Oils gave us our first Townsend’s Solitaire for the count circle, but not too much else. Half an hour at High Wood Camp-ground found us 2 Rufous Hummingbirds, 3 species of Flycatcher, some of the ever-present Swainson’s Thrushes, Lincoln’s, Clay-coloured, and White-crowned Sparrows, and a couple of other species. We were losing light at a decent pace, so we drove straight to Frank Lake. 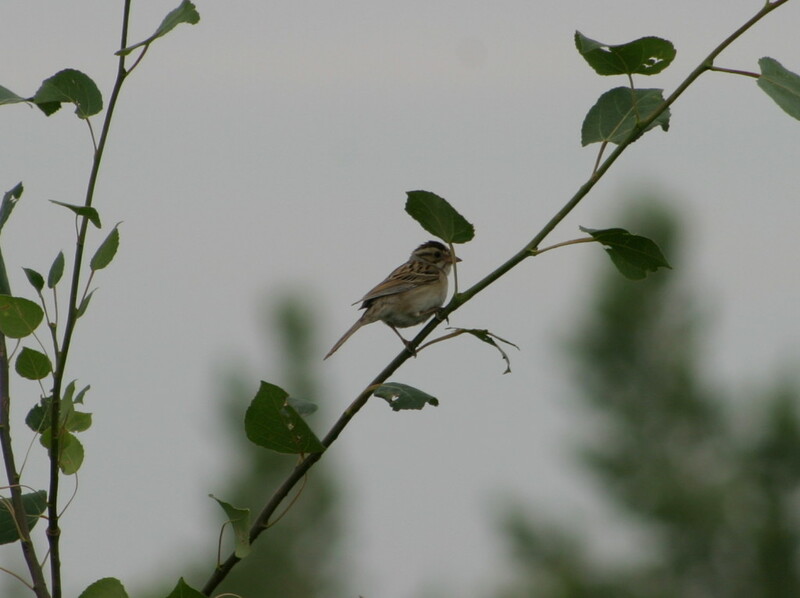 At the North Parking lot, we found 65 American White Pelicans, a Vesper Sparrow, and the lifer, Sprague’s Pipit! 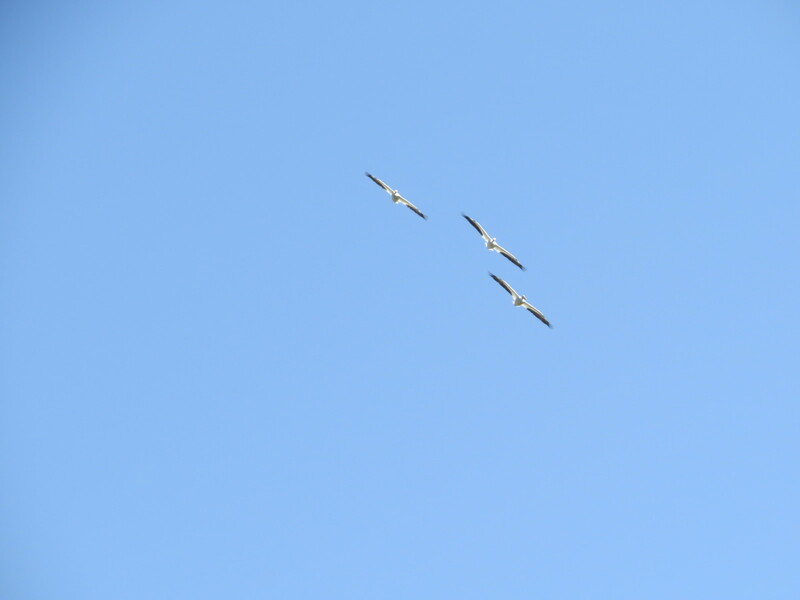 Always ones for synchronised flying! The last place we birded was at the North-West lookout of Frank Lake. 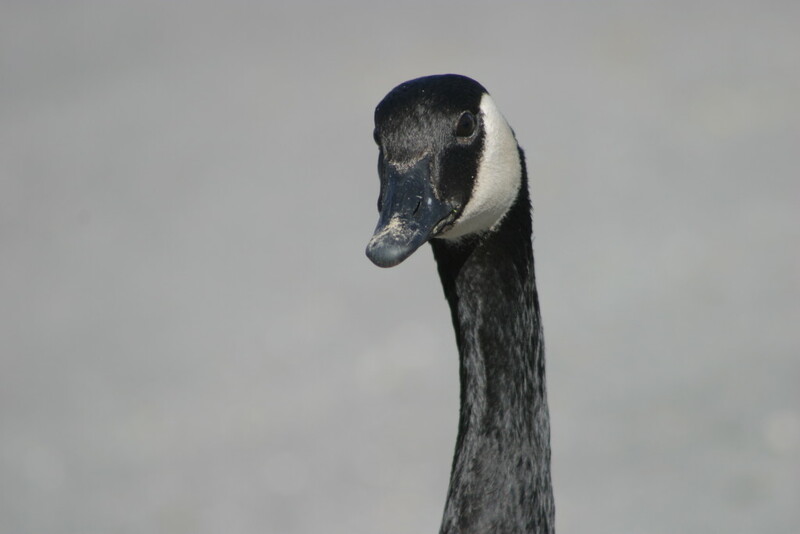 There, we increased our Pelican numbers to 135, and picked up Western Grebes, Black-crowned Night Herons, Marsh Wrens, Ruddy Ducks, and, mixed among the 100 odd Canada Geese, there was a Cackling Goose! Thanks to my Viper Vortex, and the two leaders of the group for confirming my identification! Now I know that this has been a long post, and if you simply skimmed over it, I completely understand, as it had 1328 words and 18 photos! Thank you for your time, those who read the entire thing! 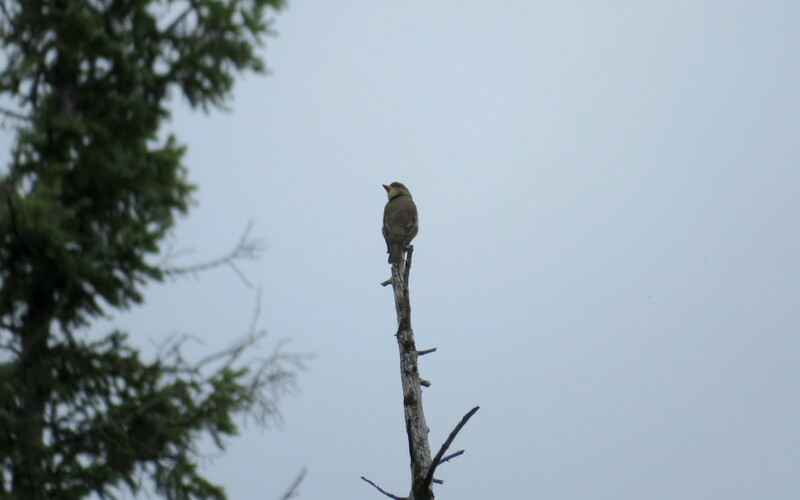 This entry was posted in 2015 Challenge, Birding Events, Birding Trips, Camping on July 13, 2015 by BirdBoy. As the new month swings around, so does the March info for the 2015 Calgary Challenge. Full of new surprises, so much data that an elephant couldn’t carry it (though my dinosaur of a computer manages it somehow), and much more, it is an important tool, whether on phone or computer, to have around. Check it out here. This entry was posted in 2015 Challenge on March 1, 2015 by BirdBoy. 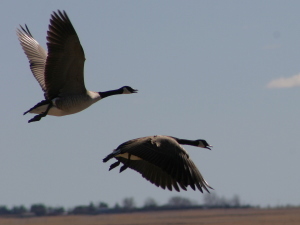 As the second month of the year approaches, a new section for my 2015 page comes forth, loaded with the information for all of the birding trips you will be doing in the count circle. 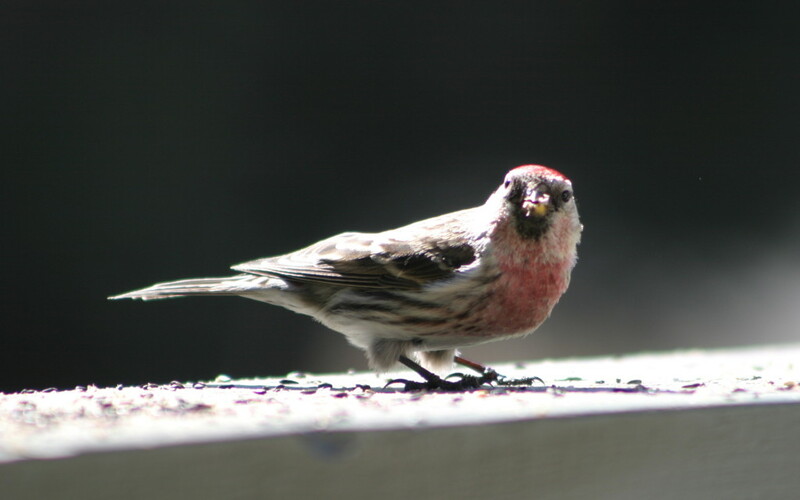 Common Redpoll, one of the birds whose best month is February. The Bird of the Month is a large woodpecker with a red crest and a habit of making square holes about ten feet up the tree. You’ve guessed it – Pileated Woodpecker! And could you be the one to find the elusive Pink-sided Junco? Find out on my page! This entry was posted in 2015 Challenge on January 28, 2015 by BirdBoy.